In The Witcher 3’s new expansion Blood & Wine, Geralt of Rivia gets a house. He gets a whole vineyard, really, but the house is the best part because you can decorate it. You can hang up your suits of armor and put prized weapons on the wall. There are some spots to put up trophies. Best of all, you can hang a painting. 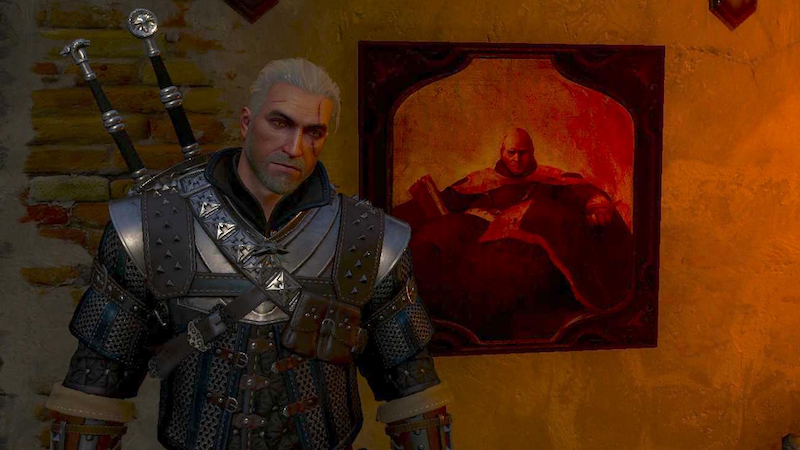 The spot for the painting is directly next to the chest holding Geralt’s “stash,” which, if you’re like me, is where you’ve been storing all the sets of witcher armor that you don’t wear anymore. If you’re really like me, you’ve also kept the “Painting of Hierarch Hemmelfart” around this whole time because his name ends in “fart” and farts are funny. In fact, at the start of Blood & Wine, that painting was the only non-gear item in my stash. Obviously, I immediately hung it up. It’s almost like CD Projekt Red knew that some of us had kept that single painting in our stash and deliberately gave us a way to finally display it. (At least one other person on Twitter told me he did the same thing.) Maybe it’s just a coincidence. If so, it is a lovely coincidence. Now, every time Geralt brings a lady back to his villa for some romancin’, he’ll have this fellow—full name Cyrus Engelkind Hemmelfart, described by the Witcher wiki as “a grizzled old man, noted racist and religious leader of the North”—watching over the bed.